Molothrus ater (brown-headed cowbird) is a small blackbird with a short, conical bill and long, pointed wings (Roof 1997). Males appear black with a unique brown head and neck. Females are either dullish grey or brown throughout. The bill is a dull grey and the eyes are black. Molothrus ater (brown-headed cowbird) breeding begins in April, peaks in May, starts declining in June, and occurs sporadically through July (GMNH 2000). 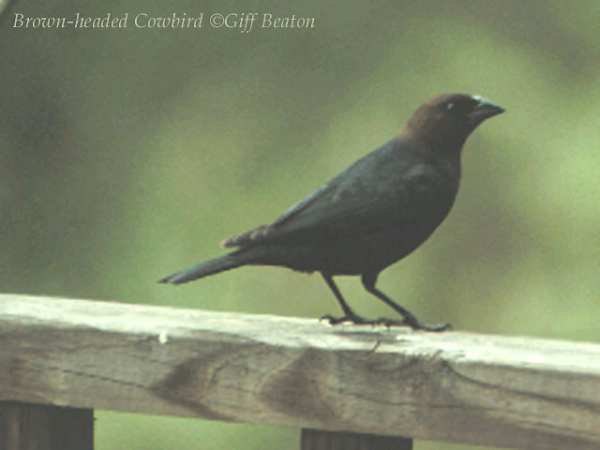 The brown-headed cowbird is parasitic and therefore builds no nest. The female can lay approximately 40 eggs in one breeding season, usually 1-2 in each host's nest. The eggs usually hatch after 10-13 days, and the young fledge in 10-13 days, with the host adults successfully raising at least one hatchling. Molothrus ater (brown-headed cowbird) prefer open habitats of low or scattered trees interspersed with grasslands; they usually avoid unbroken forest. Brown-headed cowbirds prefer, and may require, areas of short grass or bare ground for foraging. They are commonly associated with cattle pastures and feedlots (GMNH, 2000). Other habitats are open coniferous and deciduous woodlands, forest edges, brushy thickets, agricultural land and suburban areas (Rothstein 1994, in Sullivan, 1995). Recommended citation: Global Invasive Species Database (2019) Species profile: Molothrus ater. Downloaded from http://www.iucngisd.org/gisd/species.php?sc=310 on 22-04-2019. Molothrus ater; the brown-headed cowbird, is a brood parasite. It operates by using other bird species as hosts to incubate their eggs and raise its chicks. It is known to have parasatised over 220 host species of birds, including the black-capped vireo, the wood thrush,the blue-winged teal and the red-headed woodpecker. Although some bird species reject brown-headed cowbird eggs, and thus cannot become hosts for the parasite, cowbird chicks are successfully reared by over 150 species, most of them being songbirds.In recent decades, many people including land managers, conservationists, and citizens have said that parasatism by brown-headed cowbirds is a major threat songbird populations in North America and is responsible for range-wide population declines in a number of songbird species. 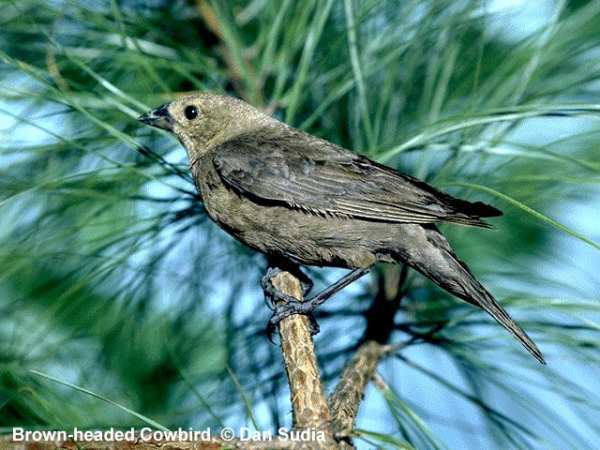 Although some species are able to renest, and therefore not lose much reproductive success because of the cowbird, other species which have shorter breeding seasons are not, and are therefore in more danger from its parasatism. Physical: Molothrus ater (brown-headed cowbird) is managed through lethal control: trapping and killing of adults and removal of eggs from host nests. Trapping is seen as the most efficient tool for removing large numbers (Muehter 2003). Informations on Molothrus ater has been recorded for the following locations. Click on the name for additional informations. Meuhter, V. 2003. Cowbirds and Conservation. National Audubon Society. Summary: A report on conservation and management methods for M. ater. Available from: http://www.audubon.org/bird/research/ [Accessed 12 July 2003]. Summary: A report on all aspects of Molothrus ater, including impacts on the environment. Available from: http://www.enature.com/fieldguides/detail.asp?allSpecies=y&searchText=brown%20headed%20cowbird&curGroupID=1&lgfromWhere=&curPageNum=1 [Accessed 5 February 2008]. Roof, J. 1997. Molothrus ater: brown-headed cowbird. University of Michigan. Summary: A general summary on the habitat and description of Molothrus ater. Available from: http://animaldiversity.ummz.umich.edu/accounts/molothrus/m._ater.html [Accessed 12 July 2003]. Sullivan, J. 1995. Molothrus ater. Fire Effects Information System. Summary: A detailed fact sheet on Molothrus ater. Available from: http://www.fs.fed.us/database/feis/animals/bird/moat/all.html [Accessed 12 July 2003]. The Georgia Museum of Natural History (GMNH). 2000. Molothrus ater. Georgia Department of Natural Resources. Summary: A report on the biology of Molothrus ater.